Julian Navarro is pleased to present Black Holes and Silver Linings, an exhibition of new works by artist Wendy Wischer, on view May 11 through June 8, 2013. The exhibition consists of sculptural objects, environments, and multimedia performative space intervention. Wischer invites us to submerge into the exploration of our own connections with nature by transforming the space into an immersive landscape – as the audience moves through it, the space itself becomes the performer, acting and reacting to movement, projected images, specific sound and multiple reflections. Having lived in both rural and city settings, Wischer has brought the natural and urban worlds together in her work. The natural world stirs a nostalgic affection and strong sense of identity; at the same time, the excitement of an urban environment and advancing technology prove to be equally intoxicating. With a minimalist approach to form and a conceptual approach to process, Wischer is lured to re-define the shape of her own environment in order to explore our shifting relationships with nature, the voice of the elements, the topography of technology and the mapping of time, space and memory. 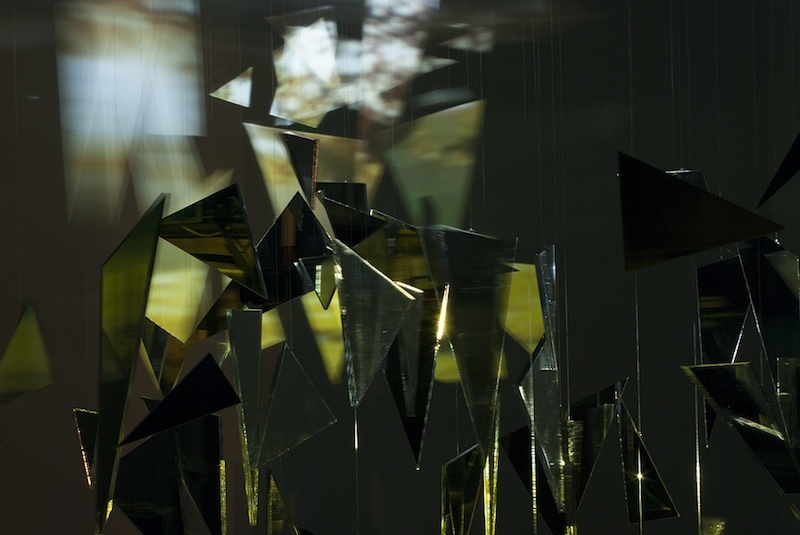 Installed in the gallery’s main space, Wischer’s Black Holes and Silver Linings, 2013 consist of thousands of mirrored acrylic fragments, projected video, and sensor-triggered sound. Referencing the personal journey over vast distances, both real and imagined, this installation arises from those life experiences that constantly tug at us, pulling us into patterns or situations that are familiar, perhaps even destructive. Similar to the pull of gravity, they become inescapable. Yet at the “Event Horizon”, when at the center of darkness, everything stills. When we can face our fears and demons directly, we can expand outward and see things in a new light. The whole can be overwhelming while fragmented parts can allow for focus and a sense of possibility. The intention is to fragment the personal journey into small parts that seem insignificant while remaining necessary to the whole – to question our position within enclosure and expansion, sound and silence. On view in the back gallery is Still Searching 2011-2013, a serene, almost floating forest consisting of 5 trees made out of black wire and mirrored mylar leaves. The trees are suspended from the ceiling with long, tentacle-like roots similar to aquatic beings. Still Searching is an installation about searching for a foundation, yet these roots have transformed and no longer need to be firmly planted in the ground. They have become free, floating and flexible with the ability to exist on their own. Wendy Wischer is interested in boundaries – where they collide, where they overlap, and where they continuously link forming threads throughout, both conceptually and visually, with a specific focus on the gap between the visible and the invisible. She addresses boundaries of nature, technology, science, mythology, personal identity and universal connections. With each new work, Wischer seeks to re-direct attention to the smaller things in life, exposing the sacred within the mundane and the monumental within the minute, as thoughts and memories, experiences and environments, continuously appear and reappear in overlapping fragments. Born in Wisconsin 1971, Wendy Wischer currently lives and works in Salt Lake City. She received an MFA from Florida State University, 1995 and a BFA from the University of Wisconsin Madison, 1993. Wischer creates work in a variety of media from sculptural objects, to installations, video and public works. Much of the artwork is based on blurring the separation between the intrinsic history of working with nature and the cutting edge of New Genre and New Media. She is the recipient of the Pollock-Krasner Grant, the South Florida Consortium, the Florida Individual Artist Fellowship, the Artist Enhancement Grant, and the New Forms Grant among others. Wendy has exhibited extensively nationally, and her international exhibits include Spain, the Dominican Republic, Mexico, Italy and Israel. Her work is part of several public collections including the Miami Art Museum, Art Bank Art in Public Places Miami and Art in Public Places Miami Beach. She recently participated in the First International Triennial of the Caribbean at the Museum of Modern Art in the Dominican Republic. She is represented by Julian Navarro Projects in NY. Artist talk in colaboration with MAAS | Mandragras Art Space. This exhibition supported by the University of Utah College of Fine Arts’ Creative & Scholarly Research Grant Fund and MAAS | Mandragoras Art Space, New York.